You can also install its open source/free plug-ins known as the ReaPlugs VST FX Suite. You can also read this tutorial for sample procedure on how to install VST plugin in Reaper. You can then experiment a lot of important audio mixing/editing effects such as EQ, compression, reverb, etc. 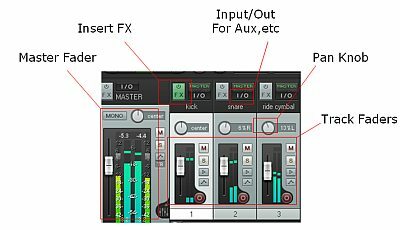 The resolution of the internal mixing engine is important to retain the accuracy and audio quality of your mix. Any processing that goes inside your DAW software are done mathematically using algorithms. There is a lot of calculations involved particularly if you are using a lot of effects in the mix. The default track mixing depth of REAPER is 64-bit floating point mix. This is similar to the one used by industry standard DAW software like Pro tools. 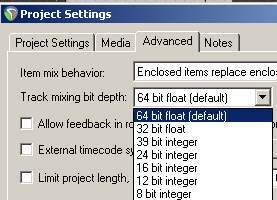 Other older DAW software only supports up to 32-bit floating mixing. 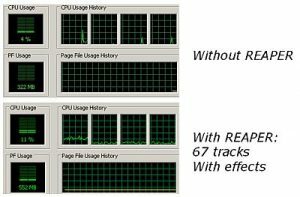 There are clear advantages of 64-bit DAW over 32-bit float Digital audio workstation. REAPER offers non-destructive form of audio editing. This is very important for digital music production since it will preserve the original recordings on your hard drive during the editing. For example if you like to re-edit the audio, you can simply repeat the editing process using the original recordings. If the above example are volume automation where you can control the amount of track volume in different time section of the tracks non-destructively. There is no dedicated/built-in audio editor window in REAPER as you would see in other DAW like Cubase. Dedicated audio editor is great for zooming detailed audio waveforms and performing sophisticated audio editing like removing noise. This is not easy to be performed directly on the multitrack session window. Nevertheless, REAPER audio editing features are sufficient enough for most basic tasks. There is also an option in adding an external audio editor in Reaper. In addition, REAPER allows you to insert a virtual instrument on a new track. This is very handy if you want to add a virtual instrument to your projects such as Superior Drummer. 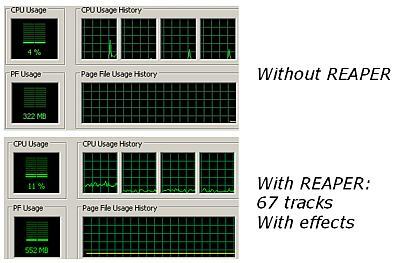 As you can see, REAPER is very light on system resources during multi-track playback. It utilizes around 552MB and 11% CPU usage for the playback of 67 tracks with effects. Based on my experience; REAPER is actually easy to use. After launching the program, you can easily insert tracks for recording by going to Tracks – Insert New Tracks. After inserting several new tracks, you can easily assign their corresponding audio interface inputs. These are particularly important for multichannel/simultaneous recording such as drum tracking or live band recording session. The tracks in the REAPER mixing session have layouts similar to real-world mixing consoles. In the screenshot below, you can easily see the tracks added like channel strip on a mixing console. These are the faders, pan knob, FX and IO. These functionalities are the heart of the REAPER multitrack project. 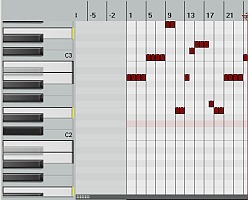 REAPER developers do a great job in providing a simplistic DAW layout design that makes it easy for beginners to use. Reaper DAW file management also allows more efficient and user friendly workflow for saving files. 2.) Cutting and selecting sections of the video and rendering the edited video as a new video file. 3.) Mixing audio tracks for a video project. There are still a lot of video editing features that are not available. For example, you cannot work with subtitles, adding detailed video effects, in-depth video editing like you see in other video editors such as Windows Movie Maker and Sony Vegas. It would be great if REAPER developers would focus on improving this feature in the future. REAPER is basically complete as digital audio workstation software for professional music production projects. The 64-bit floating summing engine and compatible to industry standard VST/DX plug-ins allows you craft the best sounding mix for your projects. This is highly recommended for beginners that are looking for a great DAW for their home digital recording studio and for those that are budget-conscious; considering that it cost only $60 to license. REAPER though is not perfectly suited for serious video/film professionals and for those sound editors that are looking for a more detailed sound editing environment.